Watermelons were considered to be very important in countries in the Mediterranean region since water was often in short supply in these areas and people could depend on this juicy fruit for quenching their thirsts. Watermelons were brought to China around the 10th century and then became popular in Russia, where much of the commercial supply of watermelons is grown. After having had a taste of watermelon, it is certainly obvious why this juicy, refreshing fruit got its name. Watermelon is very high in water content, approximately 92%, giving its flesh a crumbly and subtly crunchy texture and making it one of the top favourite thirst-quenching fruits. Did you know that watermelons are really vegetables and are related to cantaloupes, squash and pumpkins. Watermelons can be round, oblong or spherical in shape and feature thick green rinds that are often spotted or striped. They range in size and weight from a few pounds to as much as ninety pounds. We usually associate the deep reddish pink colour with watermelons; in fact, there are varieties that feature orange, yellow, or white flesh. 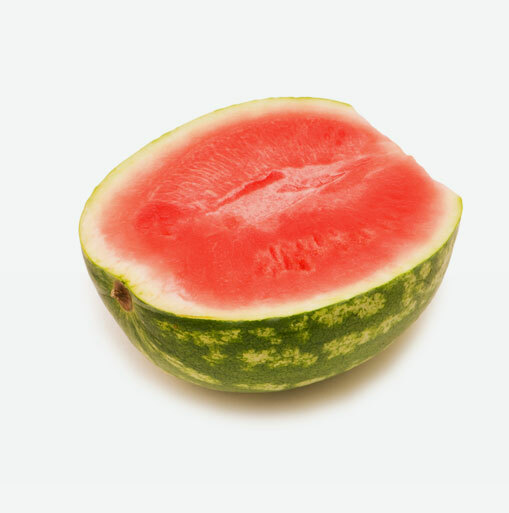 While most watermelons have seeds that are black, brown, white, green or yellow, a few varieties are actually seedless. Did you know that watermelons are really a vegetable? Watermelon is sweet, juicy and thirst quenching on a hot summer day. It’s packed with some of the most important antioxidants that our bodies need. Watermelon is an excellent source of vitamin C and an excellent source of vitamin A, because of its high concentration of beta-carotene. Pink watermelon is also a source of the potent antioxidant, lycopene. These powerful antioxidants travel through the body neutralizing free radicals. Free radicals are substances in the body that can cause a great deal of damage. They are able to oxidize cholesterol, making it stick to blood vessel walls, where it can lead to heart attack or stroke. They can add to the severity of asthma attacks by causing airways to clamp down and close. They can increase the inflammation that occurs in osteoarthritis and rheumatoid arthritis and cause most of the joint damage that occurs in these conditions, and they can damage cells lining the colon, turning them into cancer cells. Fortunately, vitamin C and beta-carotene are very good at getting rid of these harmful molecules and can therefore prevent the damage they would otherwise cause. As a matter of fact, high intakes of vitamin C and beta-carotene have been shown in a number of scientific studies to reduce the risk of heart disease, reduce the airway spasm that occurs in asthma, reduce the risk of colon cancer, and alleviate some of the symptoms of osteoarthritis and rheumatoid arthritis. The best way to choose a juicy and flavourful melon is to look at the colour and the quality of the flesh. The flesh should be a deep colour without white streaks. If it has seeds, they too should be deep in colour. Most times we don’t have the freedom when buying a watermelon to look at its flesh and seeds. Normally watermelons are purchased whole and uncut. When you are choosing a whole watermelon, look for one that is heavy for its size with a rind that is relatively smooth and that is neither overly shiny nor overly dull. In addition, one side of the melon should have an area that is distinct in colour from the rest of the rind, displaying a yellowish or creamy tone. This is known at the “underbelly” or the place that was resting on the ground during ripening. If the fruit does not have this marking, it may have been harvested prematurely, which will have a negative effect on the taste, texture and juiciness of the watermelon. Watermelons need to be kept in a cool place and since they are perishable, they should be consumed within three to four days of purchase. Cut watermelon needs to be sealed in a container and refrigerated. Use as soon as possible or it will begin to turn mushy. Wash the watermelon before cutting it. Due to its large size, you will probably not be able to run it under water in the sink. Instead, wash it with a wet cloth or paper towel. Depending on the size of the watermelon you choose, there are many ways to cut it. The flesh can be sliced, cubed or scooped into balls. Watermelon is delicious to eat as is, while it also makes a delicious addition to a fruit salad, you can also make jam, sorbet and watermelon juice. Most watermelon lovers are used to eating the juicy flesh of the watermelon, but both the seeds and the rind are also edible. If you choose to eat the rind, it is highly recommended that you choose an organic watermelon. Sugar baby watermelons are considered an ‘icebox’ type of melon. They are round and 6 to 8 inches in diameter. Sugar baby watermelons are just the right size for the refrigerator and weigh approximately 5-8 lbs. The dark green rind is hard and not easily damaged. The flesh is a bright orange-red in colour and tastes sweet and crisp. Seedless watermelons can weigh from 10 to 25 pounds and have a red or yellow flesh. They are oval to round in shape and have a light green rind with dark green stripes. Seedless watermelons are great for sorbets and beverages. Try putting chunks of seedless watermelon in the blender and use this for margaritas, daiquiris or lemonade for a new twist. Yellow fleshed watermelons weigh anywhere from 10 to 30 pounds. They have a yellow to bright orange flesh and are oblong to long in shape. Their rind is light green with mottled stripes. Use yellow flesh watermelons for variety and colour. You can make colourful fruit kebobs with chunks of yellow flesh watermelon and other seasonal fruits. Toss these delicious chunks into a fruit salad. Ice-Box watermelons are red or yellow fleshed and round in size. They can weigh 5 to 15 pounds. These watermelons have a dark or light green rind. The Ice-box variety of watermelons make great additions to salsas. Substitute tomatoes for ice-box variety of watermelons in your salsa recipe. Serve this with grilled chicken, fish or pork.